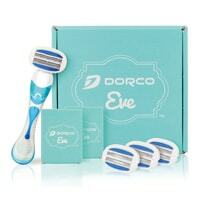 Dorco EVE 6 razor is specially designed for women and comes with a bendable ‘double 3 blade’ format. They want you to get it for free and try it out. Inside the free sample pack, you will find one razor hand and one blade. Add it to cart and checkout using your details to get it for free. Click on “GET IT HERE” button and then follow instructions given above to receive free Dorco EVE 6 Razor. You will have to pay a small P&P charge.